Thanks to Oliver Waitze (left) of the New Acoustic Gallery (NAG) in Solingen, Germany, for the NAG's April 2012 newsletter, which can be downloaded as a pdf format document, or viewed on the news pages of the NAG website. The website itself has a new layout, and instruments now in stock at the NAG include a 1962 Gibson RB-100 banjo with Tony Pass rim; Deering banjos in 4-, 5-, and 6-string format; a 1957 Fender solid-body electric mandolin; and an 'Audrey' model gypsy jazz guitar in birdseye maple by the Spanish luthier Geronimo Mateos. 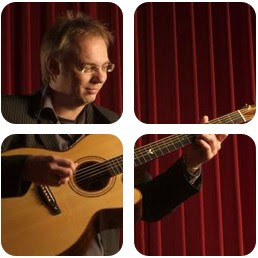 Oliver Waitze will be giving a week-long flatpicking guitar workshop (21-28 July 2012) at Poderino San Christophoro in Tuscany, Italy. Argentinian guitarist Enrique Corea, a former member of the David Grisman Quintet, will be performing in concert at the NAG on 2 June 2012. Full details are in the NAG newsletter.